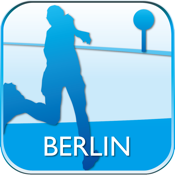 "GPS-R for Berlin Marathon" is an application specialized for Berlin Marathon which operates at some places as a reminder application GPS-R.
- You can check marathon courses and your present location on maps. - Courses of five kilometers and surrounding sightseeing spots are registered in advance as reminders. - After allowing communication, it is possible to use a vibration or notice sound that goes off when you come close to the registered reminders. - You can also automatically send posts on Twitter or e-mails when making notifications. This can also be used in TapTime recordings. - It also operates in the background, of course. - It is possible to check and compare courses and the present location in advance. You can also record the time when you pass each point in a marathon. - If you allow e-mail and Twitter communication, you can also tell your family and friends when you reach a certain place. It is also an effective tool when meeting someone at a sightseeing spot and for communicating while you are busy driving your car. - Something that is different from GPS-R is that it is not possible to create reminders at freely at any place. - There may not be updated in the background in the case of iOS7. Please check that go to the "Settings" -> "General" -> "Background App Refresh", update the background is enabled.